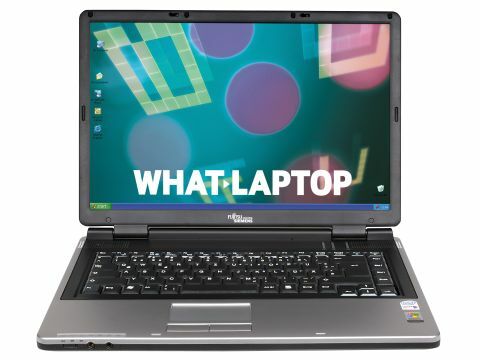 A union of two prominent technology manufacturers, Fujitsu Siemens (FSC) is a respected name in the laptop market. Providing strong performance and features lacking from its rivals is the FSC AMILO Pi 1505 (£499 inc. VAT). Designed in the standard FSC silver/black colour scheme, the AMILO suits business and consumer use. Its 2.7kg weight is very light, and is backed up by a battery life of 201 minutes. A 15.4-inch Super-TFT screen sets it apart from its peers. Rare at this price point, the glossy coating provides stunning colour and image quality. The 1280 x 800 pixel (WXGA) resolution is predictably low, but adequate for most day-to-day use. As expected, multimedia performance is also low, but suits basic use. Powered by Intel's 945GM graphics chip, a score of 1288 was achieved from 3DMark 2003 tests. Gaming potential is limited, but graphics are fine for playing DVDs and multimedia presentations. The use of Intel's Core Duo T2300 processor is impressive. Intel's dual- core processor is a great addition at this price. While performance is not outstanding, the dual-core chip provides compatibility for the future. Supported by 512MB of memory, the AMILO scored 201 points from MobileMark 2005 tests, so the most demanding tasks run smoothly. Rather than provide basic storage capacities, FSC goes one better. With a 100GB hard drive, there's ample space for storing audio and video files. A dual- format DVD rewriter makes it easy to back up to external discs. Network connectivity is a mixed bag. Fixed Ethernet connections run at 10/100 Base-T speed, while 802.11a/g wireless means hotspots can be accessed at high- speed in the UK and abroad. An excellent software bundle is also included. Microsoft Works provides basic office tools, while various Adobe applications allow for advanced photo and video editing. Even if it were more expensive, the Fujitsu Siemens AMILO Pi 1505 would be an essential purchase. At such an affordable price, this laptop is even more impressive for the new consumer. The dual-core processor and large hard drive mean the system will grow with you over the years as your skills and needs progress.